Honestly, nothing from the features in the announcement of the Fedora 24 release didn't manage to excite me intro upgrading my desktop from an old, out-of-support Fedora. It's main task is to edit digital photography and for some years a Linux solution is decent at it. Still, the devil is in the details! 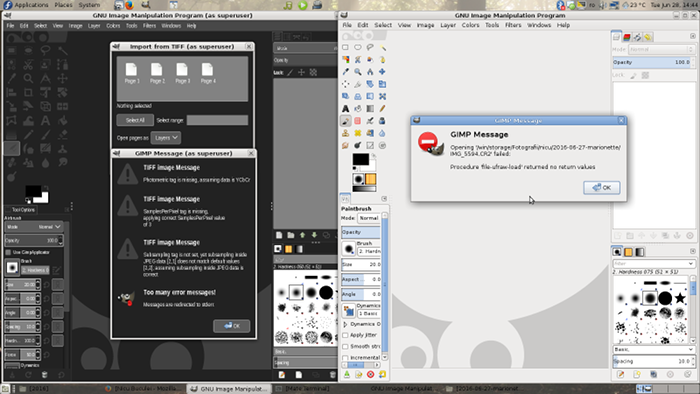 I wanted to switch to the (relatively) recent 2.x release of darktable and maybe play a bit with development versions of GIMP. Obscure tasks from a release notes point of view, but a big use case for me. It was a 2 weeks window from the F24 release to the next big incoming project, plenty of time to fix any small annoyances, right? Well, not so fast :) The first thing to notice, was GIMP (2.8.16, stable) being close to useless: it can't import RAW images, due to the import plugin (UFRaw) segfaulting in the process. You can still use the app, but only for JPEG snapshots, not for anything serious. Of course, there are workarounds: use another app, like darktable (remember, my first reason for the upgrade), for the RAW-to-JPEG conversion and then polish it with GIMP (something which is part of my workflow for some scenarios). Not so fast, again! I wasn't able to discover the cause, but my darktable in Fedora 24 crashes a lot. A lot more than... say Windows 98 (first edition) in a bad day. Anecdote: for one particular photo, it crashed 4 times in a row (open the app -> select image thumbnail -> press the export button). It worked with a Windows 98 "solution": close everything else, try once more. Perhaps in a couple of months it will be smooth, but for now the upgrade don't look like a good investment. For the foreseeable future I do not intend to return as an organizer for Wiki Loves Monuments, five years of working on the Romanian edition is enough for a person, the time has come for new blood and new enthusiasm. Myself I am burned enough. And, arguably, any community project has to attract new contributors, if not perhaps it lived its life. Note: I won't be totally out of the picture, if there is a Wiki Loves Monuments in 2016, I will most likely contribute some pictures and if the organizers will feel a need for punctual help or want to borrow some experience, I should be available. With this melodramatic intro over, is the time go back to the topic: a "post-mortem" is a cold analysis of a project, made after its end, looking at what worked and what didn't. The intention for it is to be as objective as possible, a learning experience for future similar projects. released under CC-BY-SA, winner of the Romanian competition. Having the fifth edition in a row happen and bring results in line with the previous editions is by itself a success. Is not trivial to have people volunteering to make it happen, sponsors to put money, contributors to participate... and having it work year after year. It was also a success for the team when it managed to secure the funding, first with a sponsorship from Ixia which had put the things in motion and later a grant from the Wikimedia Foundation, which allowed for a lot of activities to take place. It was useful to have the infrastructure already set-up on Wikimedia Commons, Romanian Wikipedia and the website, which is hosted by RLUG/ProLinux, as it was useful to have Asociaţia ARCHÉ handling the money, as a legal entity (traditionally, the project is run by an informal group of people and needs such legal coverage). ~6000 images uploaded in one month (~5600 at Commons and ~400 at Romanian Wikipedia) is a success. Compared with previous years, is not the best, nor the worst, but in the international context, we are in the top third of the 33 participating countries. At the first sight, 127 participants is kind of low compared with previous years (only 2013 was lower) and definitely under the 200 mark we hoped for. But that mark was optimistic, there are not many Romanian Free Software/Free Culture projects with so many contributors. For the Wiki Weekend expedition we had a few empty places on the bus, but in the end there are 600 images (504 at Commons and 86 more at Romanian Wikipedia) within the expedition category, which is 10% of the total images. It was for the first time we held an Edit-a-thon, so we lack terms for comparison, but any way you take it, especially for a first, is a success to have 10 participants, 702 images (628 at Commons and 74 more at Romanian Wikipedia) and 11 Wikipedia articles. Also a first time was the new article writing contest, where 6 people added a total of 343 Wikipedia articles, most of which are stubs, but they are at least an inviting start. Lacking a reference point, I don't know how to call this other than a success. The photo exhibition with winning images was open at F64 Cafe in Bucharest for about 3 weeks. The exhibition was quite small and its opening was pretty much an intimate event, so the impact was not impressive, but there is a chance for the situation to improve, if we stick to the plan and the exhibition will move to several other (and more visible places) in the coming months. Also, a positive is the top 10 of winning images, this is good stuff. Not only by my subjective opinion, but also the fact that one of ours makes on the international winners list. I left this for the last, since the social media impact is kind of a mixed bag: we ran a "photo of the day" thing for the entire duration of the contest (the month of September), which on facebook it was really weak, with a top of 22 likes for an image but on Google Plus it was much better (tenfold or better). Here I assume total responsibility for selecting and sharing the images and not spamming at all. From the things we did badly, the most important I consider is being late to everything. We were late to apply for the Wikimedia Foundation grant, which in turn was approved even more late. Not having the funds secured, we missed to opportunity to promote the contest in advance and may be an important cause for the somewhat weaker participation. We were late in planning and announcing the expedition, and this can explain the weak participation. We were late announcing the winners and were late awarding the prizes and opening the exhibition, thus breaking a few promises. In front of the community I can't say more than I am sorry, we did poorly with this, please don't judge us too badly for it. We also had a problem with the jury: one of its members simply became silent exactly when he was needed to do his part of the work. So at the time when we were supposed to count the notes, sort the results and publish them, we were in fact searching for replacements for that jury member. That was a human resources error and a lesson: do not rely on people who don't care about your project. Another failure was the attempt to collaborate with a traditional photography festival. There was no synergy and my estimate is that not even 1% of our final images came as a result of it. Personally I can't tell what went wrong here, as I was not involved at all with it, I could only speculate some obvious reasons, but prefer not to do that. Much like anyone else, I also wait for a more pertinent analysis. We had no media partners, not for the contest, not for the exhibition, not for anything. This is related to the first bad point above, being late. We didn't know in advance what we will really do, so it was not possible to forge any media partnership nor to announce our intentions in advance. There is also a problem with the source of the incoming images: the bulk of them came from very few people. 75% of the images were uploaded by the top 12 participants, or close to 60% by the top 5, or close to 23% by an one single person. This isn't healthy at all. Consider that the top contributor by number of images, who also was a big contributor last year, due to personal issues most likely won't be available next year, it starts to look grim. If it want to continue growing, the contest must find some new audience and new participants. The thing is, in any human activity there will be parts that go well (the good) and parts that go not so well (the bad), but there are also parts which are frustrating and no matter how hard you work, they will happen anyway. In my Wiki Loves Monuments 2015 experience, those all were related to the community. Now I am not a newbie to the Free Software/Free Culture communities and know well what to expect: they do mirror closely any human community, so is to be expected to encounter politics, power plays, egos, hidden agendas, individuals with total lack of social skills and such. I do have the guts to deal with them, Hell! if needed I can be a versed troll too! I'm not crying here, just listing some ugly things people can expect. Traditionally we targeted the Romanian Wiki Loves Monuments to people outside the existing Wikipedia community, since a major goal for the project was attracting new contributors. However, this edition we tried additional things, like the article contest, which was addressed to existing contributors and even to existing heavy contributors. It went with flames, accusation of cheating and strong language. Not nice at all! Our organizing team as a whole was blamed for not having many Wikipedia contributions. Yes, it is true that myself, I contribute occasionally and my contributions are more likely to be to Commons than Romanian Wikipedia (as an user, I prefer to read the English Wikipedia anyway) and yes, is true two of my colleagues signed-up only a year before, when they joined the 2014 organizing team and their contributions were related strictly to the contest, but you know what else is true? For five years, every single year we ran calls for help and in all those years there was one single existing contributor even who really replied and joined the team (unfortunately, for logistic reasons his contributions were limited, he lives abroad, does not use social media and such). So I had no problem replying "pleas join the team and make this happen!" But don't imagine this is limited to the local community! One example is when I had the idea that nominating some of the pictures as quality images can be in itself some kind of reward for their contributors. I did not run the nominations myself, so I was not the one to be the most frustrated, but I observed the process. Most of the pictures are rejected with negative feedback from a number of people, who sit themselves on large numbers (sometime thousands) of average pictures labeled as "quality" (while winners of national or even international competitions are not good enough). I guess any such writing needs a conclusion, so I'll try to come with one: running such a project can be fun, it can be even rewarding on a personal level, but for a finite while. Fresh air and a fresh perspective are needed.